I’ve been doing some traveling lately, and I’ve noticed some interesting differences between drivers in Minnesota, Texas and California. As much as I love my home state, I have to admit California has better drivers. We were sitting in traffic on “The 5” about 40 miles north of San Diego. The morning fog was beginning to dissipate. I glanced into the rearview mirror and saw a motorcyclist coming up from behind us, riding quite confidently between the lanes. The American Motorcycle Association (AMA) advocates lane-splitting as a way to promote motorcycle safety. A 2014 California study showed that riding the white line prevented motorcyclists from being rear-ended in heavy traffic. If you’ve ever been in southern California, you know that freeways are clogged morning, noon and night. The ribbons of headlights and taillights stretch for miles. Lane-splitting is legal in California. It’s verboten in Texas and Minnesota. It’s easy to see why. In California, car and truck drivers tend to stay in their lanes whether they’re moving at freeway speed or at a stand-still. Texans and Minnesotans, on the other hand, are enthusiastic lane-changers. They change lanes often and don’t bother to signal their intentions. In freeway backups, it’s not uncommon to see a Minnesotan wrench his steering wheel left or right and stick his nose into the next lane . . . right into the would-be path of a whitelining motorcyclist. Texans and Minnesotans also like to “park” in the far left lane, which should be reserved for faster-moving traffic. This causes other drivers to pass them on the right. On our way south through San Antonio, we observed several “bats out of hell” come up behind us, cut across three lanes of traffic from the right and zig-zag back the other way at speeds far above the posted limit (which, I will admit, we were not observing, either, but these guys were smoking!). The crazy driving, in fact, began shortly after we crossed the Oklahoma-Texas border. There’s no hope for a lane-splitter there! 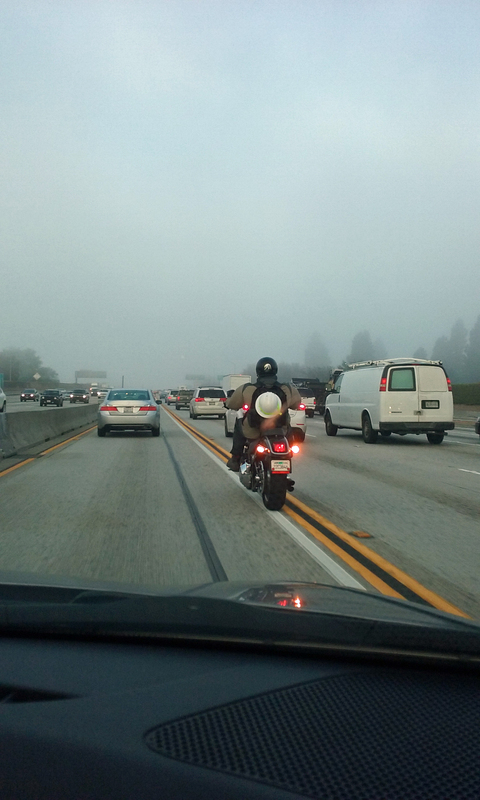 The AMA’s rationale for lane-splitting makes sense. But it can’t be done safely in the Lone Star or North Star states.